A couple of months ago, I took the boys to the Farmer’s Market one Thursday after school. There was a vendor who sold frozen-granita type drinks and, after a little bit of begging from my male companions, I broke down and purchased two. With the understanding that we’d share them. It went as well as can be expected. Meaning, the lidded cup was dropped on the concrete floor at least once before we made it out of the building. And I’m sure the interior of the car-van received an extra coating of ‘sticky’. And there were occasional yelps of ‘he’s not sharing’ or ‘he’s drinking it all’. But generally, there were no fisticuffs and all were happy with the treat. Until……twenty or thirty minutes afterwards when my oldest two turned into ultra-obnoxious versions of their former selves. It was surreal. As far as being hyper-aware of the effects of certain foods on my children, I’m on the ‘slacker’ end of the continuum. I don’t tend to say things like ‘oh, if he has cheese after 3pm, he doesn’t sleep’, simply because I’m not alert enough to make such connections. But their behavior was so outlandish that day after the Farmer’s Market, there was just no denying that whatever they’d ingested had made them….nutty. So I had to come up with an icy drink alternative. Because (1) I like frozen drinks, and am not willing to give them up just because my children are susceptible to food coloring and who knows what else. And (2) it would – eventually, possibly – get warm enough in Calgary to necessitate a cooling beverage. And what would I do? Hand them ice cubes and tell them to pretend it’s a popsicle? Then one day, while pushing a boy-laden cart through the Superstore, it hit me: I would make slurpee-slushies. I would buy fruit juice. Pour it into ice cube trays. Freeze it. 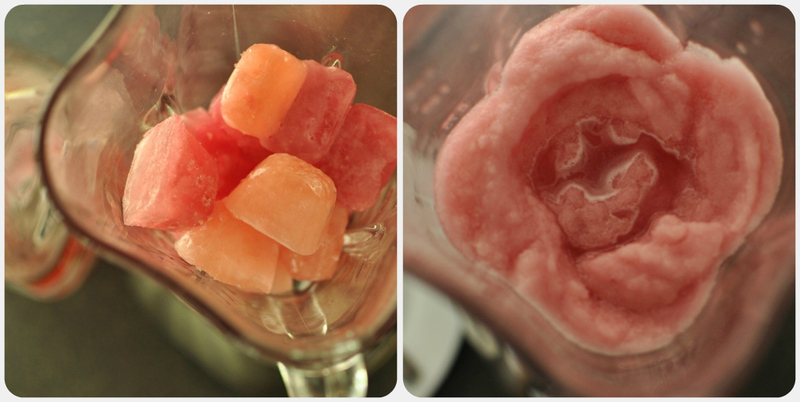 And decimate the colored cubes in a blender with the help of more juice or water. And the taste verdict from all involved? Kim, they’re delicious! The boys ask for them all the time – which is its own problem, I guess.